Our Shadow Box Frame adds a gallery character to your pictures. We place your photo in an extra deep frame with plenty of space between it and the glass. As always there are plenty of ways to customise your piece. If you choose our Original Photo Print On Aluminium Dibond, your photo is mounted onto the metal backing and then set in the frame. 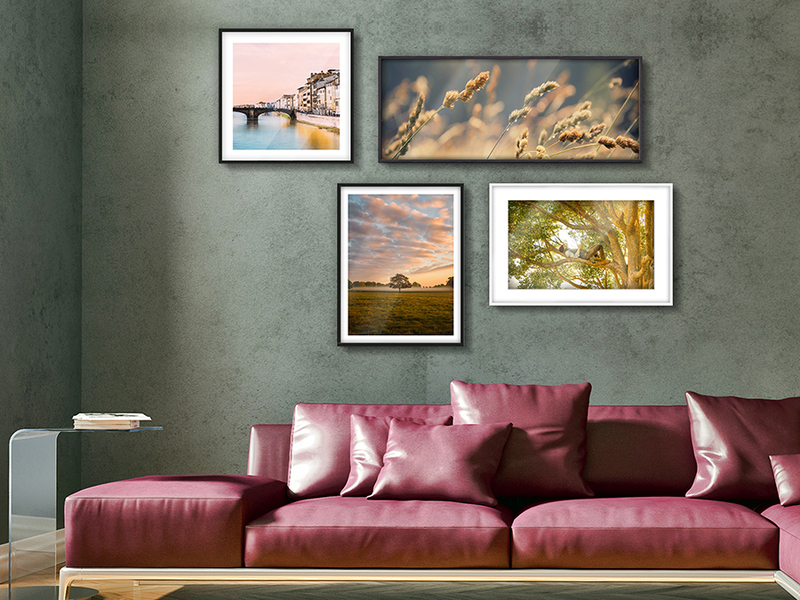 Photo prints mounted on aluminium Dibond and set in a Shadow Box Frame have exceptional depth and brilliant colours. Aluminium Dibond is extremely robust but is still very light. Sturdy aluminium Dibond: Stability at a low weight even in large formats. The high-end, brand name paper is matted evenly and reliably with museum card. This prevents distortions, and in this version, the edges are slightly elevated. You can customise the passe-partout around your picture with a width anywhere between 5 - 20 cm. In addition to photo prints, we also offer pigment prints on 5 different kinds of Hahnemühle Fine Art Paper. Our William Turner with a matte watercolour texture is excellent for authentic portraits or extraordinary photo concepts. Our Fine Art Pearl is pure white with a silky surface for great depth with precise contrasts for colour and black-and-white photography. The distance between the picture and the frame creates the impression the image is floating. The photo’s separation from the frame makes it the center of attention, while the frame provides an elegant border. The picture is evenly mounted on aluminium Dibond for a long-lasting and durable result. Our shadow box frames add a gallery character to your pictures. At WhiteWall, we place your photo in an extra deep frame with some distance to the outer glazing. As always, you have some options to choose from here as well: For an original photo print on aluminium Dibond, you photo is laminated completely onto the aluminium Dibond backing and then presented in the frame. 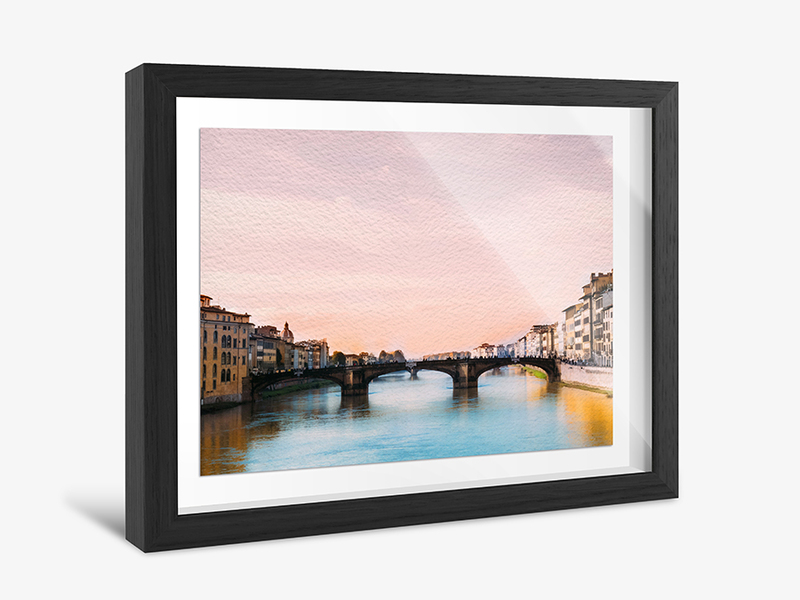 Alternatively, you can have your original photo print or fine art print applied to a coloured backing of your choice at a distance to the frame. For a floating image effect, we laminate your picture on the aluminium Dibond backing and attach it with a distance of approx. 1 cm from the backing. The image appears to float in the frame. We also offer the passe-partout option as a floating version, which adds even more depth to the image. You can specify any distance between object and frame. You can optionally choose an image with a white border as well. It isn’t always easy to choose and we do want you to think about it well – because it is important that you choose exactly right for your picture. 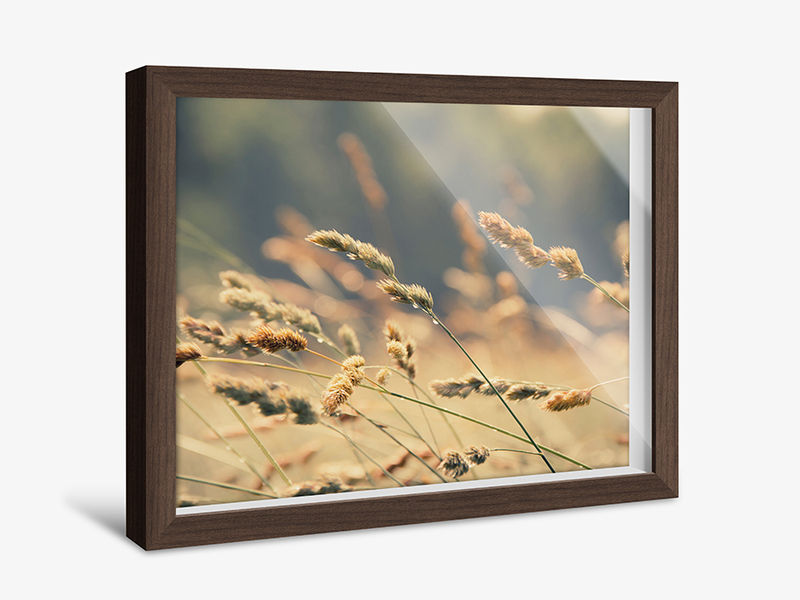 Our shadow box frame is available in various colours: in black oak, in brown maple or in white maple. More options to think about are format and size, because we create your frame in the dimensions you choose – to the exact centimetre. And finally, you have to choose how we ship your picture to you. Everything else you can leave to us and your product will reach you safely and undamaged. Then comes the last decision you have to make: Where to hang the picture? But don’t worry: It doesn’t have to be one final decision, because our shadow box frame can be hung wherever you like. And is repositioned just as easily. 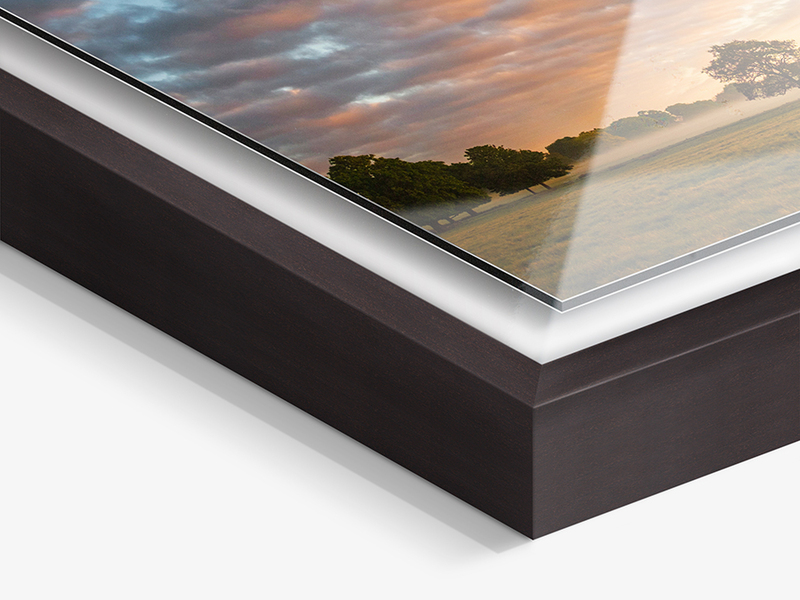 Once the picture is up on the wall, you can then decide about some other high-quality options: Our original photo print under specialist resin is another of our exceptional and valuable premium products. The liquefied resin flows to the edge of the picture where it cures and forms rounded edge typical for specialist resin. The result is an ultra-transparent, brilliant finish for a crystal clear view of the image with great depth of field, crisp details and brilliant colours. 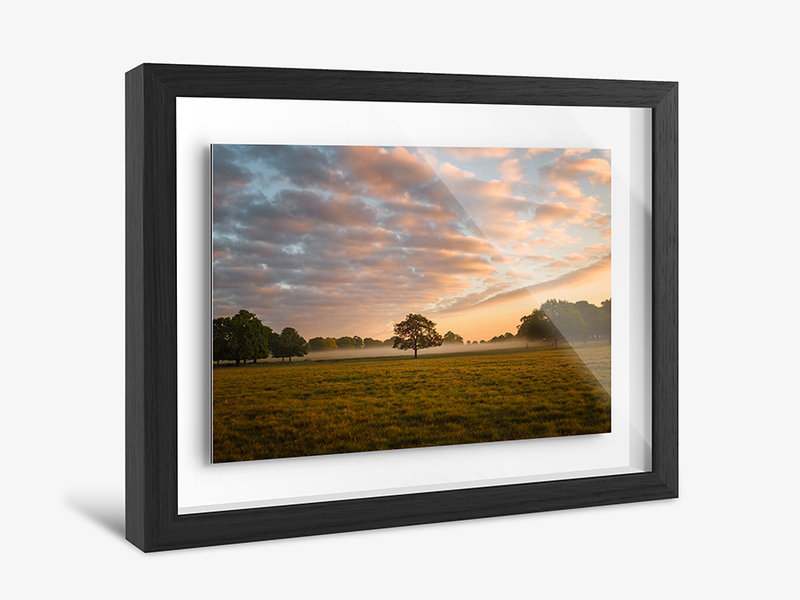 Less costly and our popular favourite is the original photo print under acrylic glass. A great depth of field is achieved with a glass thickness of just 2 mm. At 4 mm you are entering the realm of gallery quality with a premium product fit for professionals. You just have to decide which of these options will be most beneficial for your picture. A difficult decision – but definitely worth your while.